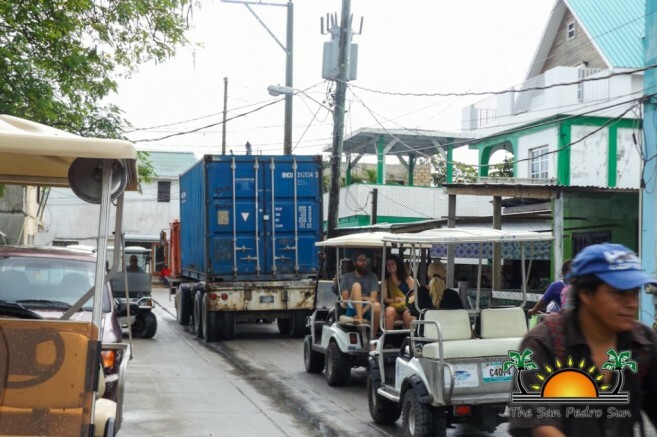 In seeking to alleviate traffic congestion on the island, The San Pedro Town Council (SPTC) has launched an experimental project by regulating delivery trucks schedules. The experiment would apply to all large-vehicle deliveries within town core but it has not been well received by the business community. Despite opposition, the pilot project will begin on Monday, April 11th, and the SPTC is optimistic. The announcement was initially made on March 10th during The Reef Radio Morning Show. All businesses that conduct deliveries within town were requested not to do so after 7AM. In addition, a press release dated March 31st listed the different type of vehicles and equipment that would fall under the controlled delivery schedule. These include all construction equipment, backhoe, tractors, mixers, standard pick-up trucks, dump/container trucks, butane trucks, skytrak, freezer trucks, bobcats, and all other vehicles considered heavy equipment, including those for towing boats or vehicles. According to the SPTC, such big delivery vehicles interrupt traffic flow and create congestion, especially during the demanding hours of the day. Large vehicles are considered hazardous to children during school days, thus the urgency to implement the new policy. “We are looking at the safety of our children and taking back control of our island streets. As a child friendly community, we need to provide a safe environment for our children,” said Guerrero. Each business was informed of the SPTC’s intention to implement the new law through a letter. A few businesses were optimistic with the new schedule, welcoming the idea of improved traffic conditions. However, suppliers were not all that convinced. 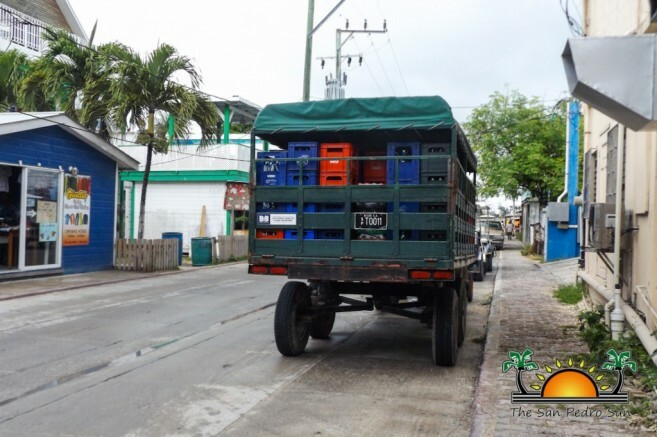 According to a main delivery company on the island, they are willing to work with the new norm despite not being consulted. However they believe that the local authorities did not investigate the nuances of shipment and goods’ arrival. Most of the products are barged to the island arriving around 5AM. It takes an hour before delivery can actually start, whereas the project wants the cut deliveries at 7AM. The supplier agent says it’s impossible to do all deliveries in the one hour remaining, thus, they requested a meeting with the Mayor in order to try and work out alternatives. In an effort to reach an agreement, Guerrero met on Wednesday, April 6th and Thursday, April 7th with the different suppliers on the island. It was rumoured that suppliers were organizing a protest due, but a delivery company dispelled that rumour. After discussing details with different stakeholders, Mayor Guerrero expressed satisfaction. “I’ve had a very productive meeting with the different business owners, and many showed their support in giving this new idea a try. 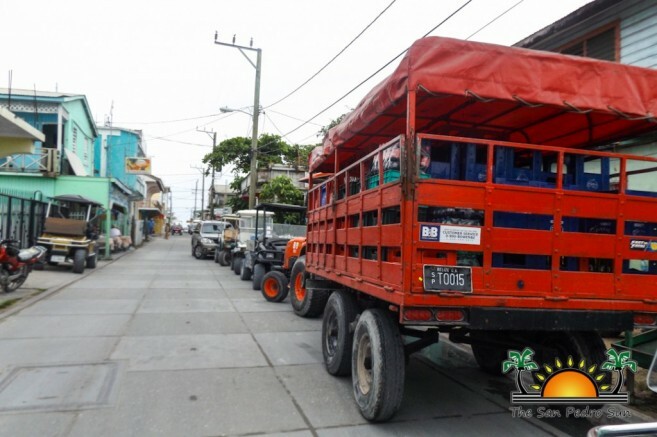 We are going to see how things work starting Monday, and from the conversation I had with them, they know that the businesses themselves, along with their partners in Belize City will need to make changes in order to accommodate the new delivery hours,” said Guerrero. Many of the businesses that were concerned about the new policy have agreed to work along with the SPTC and committed to try their best to meet regulations. After a few weeks, adjustments will be made as necessary with local authorities and the business community working together. The areas to be tested are from Zericote Street (north boundary of the San Pedro High School property) to Coconut Drive, right at the cut-off with Manta Ray Street by Belize Water Services office, leading to the Dr. Otto Rodriguez Polyclinic. Also under the new plan are Barrier Reef Drive, Pescador Drive, part of Laguna Drive, and all adjacent streets and beach areas. Additionally, it was also noted that after 7AM only Carry-All Golf Carts and motorized tricycles will be allowed to do deliveries. In order to do so, a permit can be obtained at the San Pedro Traffic Department (SPTD) for a small annual fee. As the island develops, there has been a high demand for various modes of transportation, whether it is for personal or business use. The SPTC strongly believes that as a community, everyone needs to work hand-in-hand to make the traffic situation better for all. The full support and cooperation of the entire business community is being requested for the success of any policy the local authorities may bring about. The SPTC is open to the general public and is open Monday to Friday, 8AM to 12 noon and 1PM to 5PM, and is located on Barrier Reef Drive. Is traffic driving away tourists?